Sergio Ramos has been praised for his "kind" attitude on the pitch by Norway international Josh King. But Ramos earned all three points for Luis Enrique's side from 12 yards, beating Rune Jarstein with a Panenka after the goalkeeper fouled Alvaro Morata. 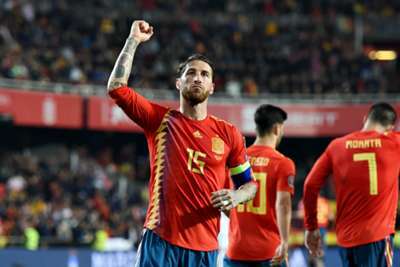 Ramos is regarded among football's hardest competitors, as well as for bending the rules on the pitch, but King was fulsome in his praise for the Spain captain. "I think that I did really well against one of the best centre-backs in the world," King told Norwegian outlet VG. "Ramos has a reputation of being dirty and rough, but I do not remember going up against a centre-back as nice as him. "I have not seen all of his matches but I think all of his challenges were clean and he seemed to me a very good sportsman. "He won some duels and I won others, I think it was a good game." Ramos' goal means the Spain skipper has scored in his last five international appearances.